olive that I came to the final conclusion: Superia makes the best vodka martini I’ve ever had. When I brought the vodka with me to our Thanksgiving party, I was too bashful to ask for a martini glass, so I drank it on the rocks in a plastic cup. Of course, I tasted the vodka neat, at room temperature first, just to get that first note of flavor, character and smoothness. Instantly, I found the Superia to not only be as smooth as Tito’s, but without the undesirable ethanol flavor. Superia is good enough to sip straight-up. I would say, Superia compares slightly to Ruskova, another Russian, bargain-priced vodka. However, I like the Superia even better. I didn’t fully appreciate the Superia, however, until I made my first martini with it back at the hotel later that evening. Using a coffee cup for my martini shaker, I shook up a glass full of the Superia and strained it into my plastic, clear hotel water glass. It was chilled – and straight, without even so much as olive for a garnish. I poured a small, neat shot of Tito’s into my martini glass and swigged it down at room temperature. My first impression was that Tito’s is an exceptionally smooth vodka – almost too smooth. Let me explain: Tito’s is so clean that the distinctive taste of ethanol is almost over-powering. It’s almost as if you’re sipping something at a chemistry lab. They say that extremely thorough distillation brings out the ethanol taste. This is consistent with the claim on the bottle that Tito’s is distilled 6 times. It is a very smooth tasting vodka with little burn going down, but is this a desirable trait in a vodka? Maybe, I’m no expert on vodka, but the extreme, ethanol flavor is bitter to me at the very tip of my taste buds and lingers way too long. Cheaper vodkas like Taaka tend to have a heaviness about them, that takes out the upper, tinge of bitterness at the very top of my palate. Still, I can’t blame those who prefer the overall smooth, light flavor of Tito’s and perhaps the distillation and clean taste will lead to a better feeling the next morning. Tito’s would obviously suit any mixed drink well. The other reason you might like Tito’s handmade Vodka is that it is gluten free. While the distillation process of most alcohol greatly reduces the risk of gluten contamination not many of them claim to be 100% gluten free, but Tito’s does. Tito’s is distilled from corn which is gluten-free grain. If your a gluten allergy suffer, this might be the best reason yet, to buy only Tito’s vodka. Tito’s is exceptionally smooth, but to my mind it really doesn’t taste all that good. If ethanol tastes good to you, Tito’s handmade gluten free vodka might be just what you want. Don’t think for one minute that Platinum is one of the best vodkas just for it’s name and pretty, blue bottle. 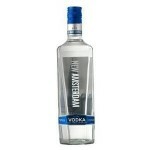 On the other hand for a $13.00 1.75 liter package, it’s certainly a decent vodka. I removed the cinnamon whiskey sample from the lid, twisted off the blue cap and poured about a half ounce in my stainless steel shaker. I always drink vodkas warm when first sampling them. The Platinum had a very noticeable alcohol-burn to its nose, but the front taste was not nearly as bitter and harsh as I expected. It went down rather smoothly and had a very crisp, pepper taste with just a bit of vanilla to it as it rounds out going down. I’d rank this maybe a tad below the Ruskova Vodka, but clearly better than Taaka. Platinum vodka is actually made by the makers of Taaka Vodka, so I suppose you could say this is their upgraded model. The bottle advertises that it has been distilled 7 times which is surely an improvement over the Taaka which has no indication at all that it’s even been distilled a second time. I dropped a couple of olives in a glass; poured in a couple of ounces of Platinum and shook it vigorously with crushed ice. I enjoyed the first martini and the 2nd one was even better. Platinum does not have a whole lot of taste, but it is bright, crisp and relatively clean for such a bargain-priced vodka. Russian Standard Vodka (Original) is one of three different vodkas made by the same company. Russian Standard Platinum and Russian Standard Imperia Vodka are the two upper-end, pricier vodka choices from the same distillery which I have not yet tried. Russian Standard, like any premium Russian vodka is distilled from Wheat. While the original Russian Vodka maybe the cheapest of the three, it is still priced in the range of premium and popular vodkas like Stoli and Monopolowa. I paid $25.95 for a 1.75 Liter bottle of original Russian Standard. You can expect to see it priced between $23.00 and $32.00 at your favorite, local liquor store. I’ll confess to two things prior to buying this: One, I was attracted by the interesting looking bottle, with Russian Calligraphy; supposedly named for Peter the Great. The bottle alone makes for good, drink conversation. Two, I didn’t actually pay $25.95. The liquor store was closing and I happened to be shopping at a most opportune time with liquor being sold at 50% off of shelf price. I paid about $13.00 for my first, 1.75 Liter bottle of Original Russian Standard . As someone who enjoys $20.00-and-under vodkas like Svedka and Ruskova, I was anxious to try an original Russian Standard Vodka at a most unoriginal price. I expected good things from such a tasty looking bottle, and my first sip of original, Russian Standard Vodka, did not disappoint. When sampling new, vodka I like to pour a couple of sips worth at room temperature directly into my martini glass. The Russian Standard Website recommends that you drink their vodka at a temperature between 41 and 44 degrees Fahrenheit. Sampling at a slightly warmer, room temperature in my opinion, makes the aromas and taste more noticeable. Russian Standard original has a very light, crisp and almost transparent nose. There is very little of that ‘natural-gas’ spirit aroma of other vodkas. First sip is thin, high and what the New Amsterdam Vodka wishes it was: Crisp, yet not overly thin-pitched and bitter. Russian Standard Vodka does have a bite, and a mild burn going down, but finishes very smoothly. I took a couple of shots and poured it into my stainless steal shaker with 4 ice cubes. I plopped an olive in my martini glass and did the usual ritual: Shook the vodka vigorously until my fingers were on the verge of frost-bite from the freezing stainless steel and my right arm was about to fall off. I poured the ice-cold, frothy vodka into a martini glass enjoying the way the shadowy olives formed steam inside the icy, transparent liquid. The colder temperature tamed the frontal bitterness of the vodka significantly. As a martini, Russian Standard is crisp, clean and sugar-like with very light overtones of vanilla and almond. Russian Standard vodka has very little caramel or other darker, earthy tones. Russian Standard is not a complex vodka, but it is infinitely enjoyable and drinkable as a martini and would go very much unnoticed in a desirable way as a mixer. The entire, first martini went down smoother than any other vodka I have ever had. I have to score this one a little bit higher than my previous favorite; Svedka. Delicious, thin, clean vodka with a light first bite, but a sugary, crisp vanilla finish which makes you crave your second martini. Russian Standard is the best I’ve had for under $26.00. It’s not because I like Cheap Vodka that I couldn’t wait to try New Amsterdam Vodka. For me, really cheap Vodka is Taaka. There are better vodka brands that are still considered cheap by vodka drinkers, where-as Taaka is considered downright undrinkable by some. So how does New Amsterdam Compare? I thought very highly of New Amsterdam Gin and numerous friends agreed that it is a great gin for the price, so this is one I looked forward to trying and because it is priced about 50% higher than Taaka, I anxiously expected it to be notably better than what I would personally consider a, cheap vodka. So, how does New Amsterdam Stand up to a cheap vodka and for that matter, a better one? To me, tasting Vodka is often like hearing musical notes on a staff. Each flavor has its own pitch. The darker, heavier ones are lower on the staff and the crisper, light and thin ones, are higher up on the staff. I Must say that New Amsterdam is a very high-pitched Vodka. It has a very crisp, thin bite to its nose and rings crisper and more bitter on the very first sip. If this does not sound like a ringing endorsement, it is not a bad one either. New Amsterdam has an adjustment period where you have to convince yourself that the thin bitter front isn’t going to go down too harshly. This Vodka is not overly harsh going down, but it does have a very shallow, thin bite that burns the top-end of your palate. It is crisp, thin and sweet, yet not much in the way of complexity or character. I believe that some people rate vodka on how little flavor it has. While Taaka is a truly cheap vodka I think it actually has more character and flavor than the New Amsterdam vodka at nearly half the price. I won’t mistake character and complexity for being an un-smooth vodka. I’ve come to appreciate the darker nose; vanilla, butter, rum and caramel in vodkas like Pearl or even the bargain-based bottom end Taaka. If Taaka and Pearl Vodka are a low A, then the New Amsterdam vodka is a high C above the treble-cleff staff. New Amsterdam is tinny, thin and crisp; not overly smooth, but not overly harsh. New Amsterdam doesn’t make a great martini because its front-end is just too darn bitter for sipping. New Amsterdam Vodka, I project, would make a very good mixer with any type of juice or sweetener because it is too light in flavor to overpower anything that you put in it. Cranberry juice would very easily mask its bitter front end. I also think that New Amsterdam Vodka would make a very good Cosmo when used with Leopold Bros Cranberry Liquer.